I originally thought of this as a single blog post but after I started researching I discovered enough information for each alphabet letter to write a book! With that idea in mind I decided to write a post each week using a different letter of the alphabet. So at the end of 26 weeks (assuming I can find enough nutrition topics starting with X and Y!) I will have written the book! Some letters will have quite a few topics and others not-so-much. If you think of any topics beginning with a letter I have not covered PLEASE send them to me via email. The more comprehensive the book is the better. 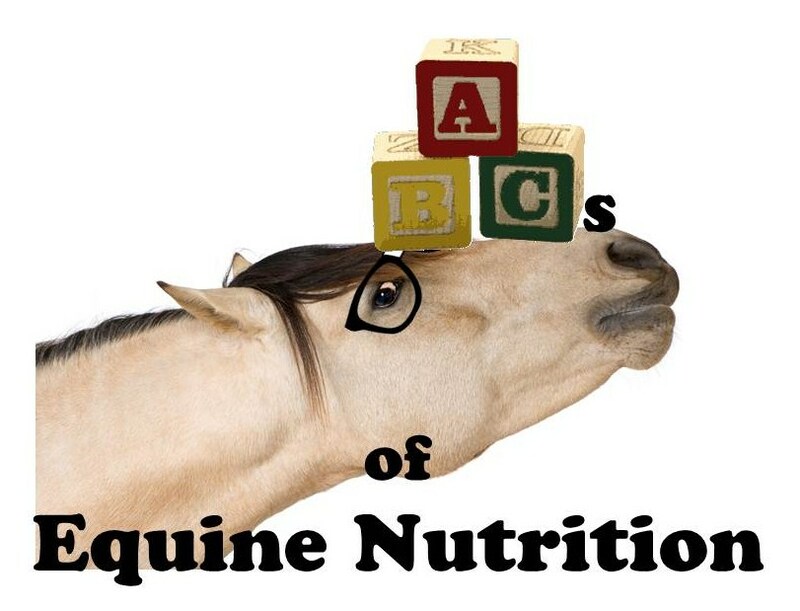 So we will take this journey together beginning with the letter A and progress through each letter discovering, explaining and learning more about the wonderful, confusing, challenging world of equine nutrition. In order for any nutrition program to be effective it has to serve the purpose for the animal you are feeding. Feeding a Shetland pony a thoroughbred race horse diet is not only incorrect but also dangerous. To know what and how much to feed you first need to know your horse’s weight, his current body condition and his nutritional needs. I say it 20 times a week “Feed by weight not volume” and you will see it again under “W” later in the year. If the rule of thumb is 1.5-2% of your horse’s body weight in feedstuffs per day then you must know the body weight to calculate the percentage. Not only does knowing your horse’s weight help in feeding rate but it also will keep you aware of any changes in your horse’s weight that might indicate health issues. The second step of our Assessment is Body Condition Scoring (BCS). In order to determine what we might need to tweak in our feeding program we need to know if our horse’s current body condition is adequate. Using the Henneke Body Conditioning system you can see and feel for fat deposits and determine a BCS of your animal. Obviously if you feel too much fat we would adjust calories down, too little and we would add calories. The final step in our Assessment is to understand the nutritional needs of your horse for the job he is doing. A pasture ornament that never gets ridden has different nutritional demands than a show jumper in competition. Knowing the caloric requirements for your horse for maintenance PLUS any extras (like exercise, breeding, growing, etc) and the energy density of your feedstuff will go a long way in maintaining the perfect weight and body condition. So our first word for the letter A was Assess. Good equine nutrition begins with an Assessment of your horse’s weight, body condition, and nutritional requirements. An additional Assessment of his diet including the caloric value of his feed and hay should also be conducted. 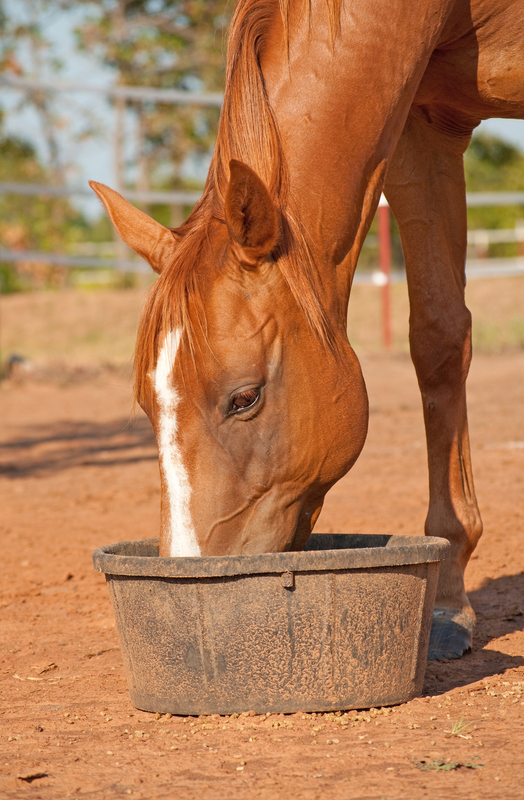 Most horse owners understand the importance of protein in a horse’s diet. Most understand that protein is used for growth and the repair of muscle and tissues. Few however can tell you what protein is actually made of. Protein is made up of Amino acids much like a wall is made of bricks. 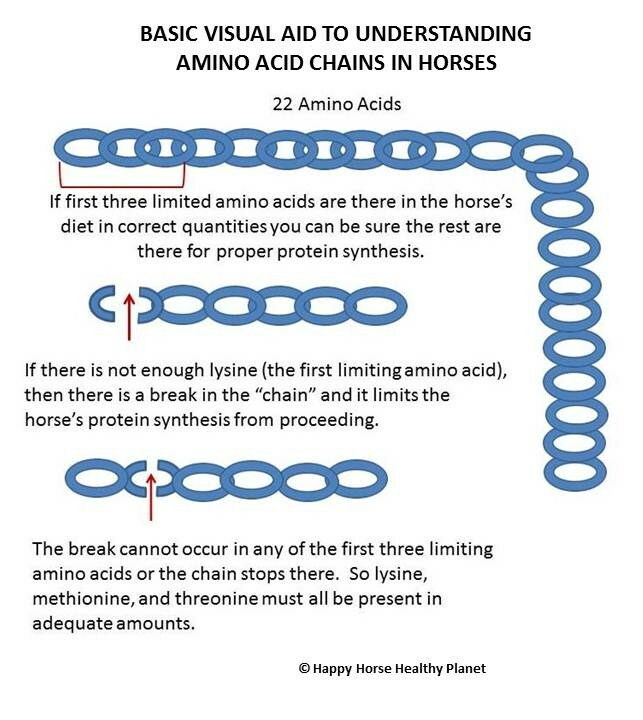 There are 22 Amino acids that constitute protein in your horse. 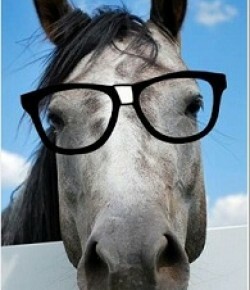 A horse needs all 22 to build proteins in his body. Horses get these Amino acids two ways; they make them in their body or they get them from their food. Lysine- Muscle development and bone growth plus stimulates gastric juices. Methionine- Hair and coat growth, prevents deposits and adhesion of fat in liver, selenium absorption, antioxidant and anti-arthritic. Threonine- Enhances growth and food efficiency, produces adrenaline, and is a precursor to thyroid hormones. Arginine- Releases insulin and growth hormone, nutritional aid in cancer therapy, fights tumor growth, and boosts T-cell production. Histidine- Maintains plasma, hematocrit and serum albumin, releases histamine, controls pain, anti-arthritic. Also stimulates stomach acid secretion and improves appetite. Phenylalanine- Produces epinephrine and norepinephrine and acts as an antidepressant. Tryptophan- Component of serotonin so acts as a mood stabilizer. Precursor to niacin, and may aid in blood clotting . Valine- Regulates protein turnover and energy metabolism with leucine and isoleucine. Is vital for muscle coordination . Leucine- Keeps muscle protein from degrading. Isoleucine- Forms hemoglobin and fights nervous system degeneration. But there is more, if the horse has enough of the first most limiting Amino acid, but then runs out of the second most limiting Amino acid, it can’t use the remaining amount of the third most limiting, and so on. In other words, if the foundation isn’t there you can’t build the wall. There are actually three Amino acids in the equine diet that are considered limiting; lysine, methionine, and threonine. Of the first three, lysine is the most limiting Amino acid. In other words, it is the one most lacking in the equine diet. Many feed tags have a guarantee for lysine because of this. But therein lies the problem. Note: This feed label is for performance, breeding and growing horses so horses that need the highest and best quality protein! Here is a different tag with all three limiting Amino acids guaranteed. This is a must to assure you get what you pay for in your grain. You’d be surprised how many expensive feeds don’t have these very important guarantees even though you might think they do. Check your tag. As we saw before, it is really important that all three be present in sufficient quantities. If they are you can feel sure that the ingredients used to provide them also provide the remaining Amino acids in sufficient quantities. Therefore, it is very important (especially in performance, breeding and growing horses) that all three are listed in guaranteed analysis of your horse feed tag, as it is an indication of the quality of the protein sources and the balanced nature of the feed. You will learn more about this when we get to “G”. When your horse ingests protein, the Amino acids that make up protein are broken up by the enzymes and acids in its digestive tract, specifically the “foregut” (stomach and small intestine). Each Amino acid is absorbed through the wall of the small intestine and into the bloodstream via the liver. 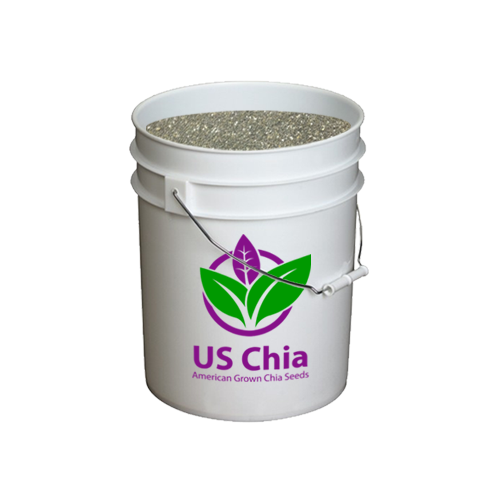 The Amino acids then travel to the areas in the horse that needing growth and/or repair. Now that you know what protein is made of we will look at another word that begins with A. Something with a very high protein level. 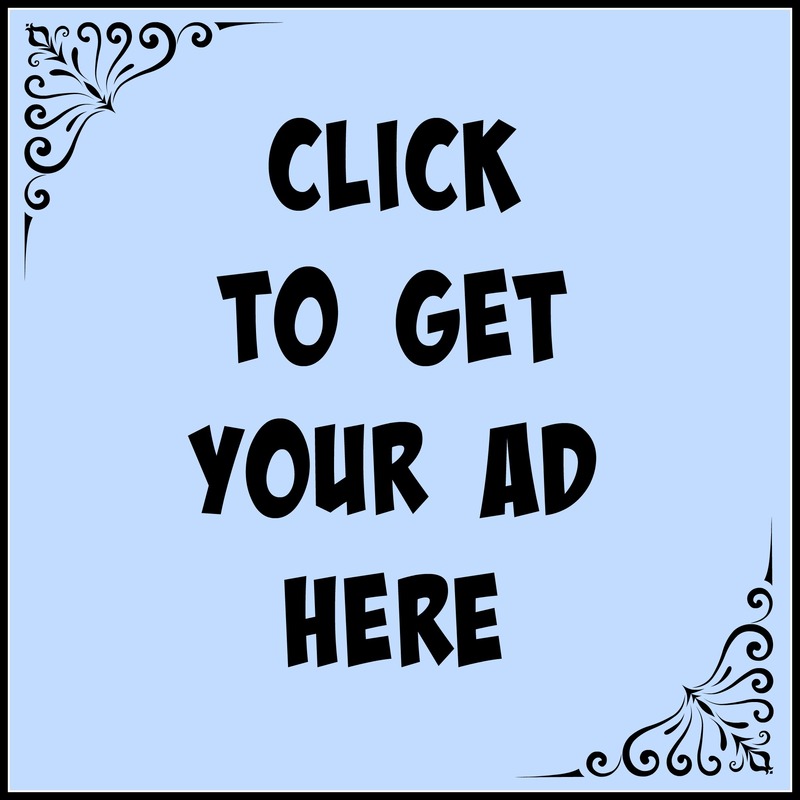 · Cubes -Hay cubes are made from coarsely chopped Alfalfa, or grass/alfalfa mixes. They generally come in bags and are therefore easy to store. They are more expensive to feed than baled hay, but there is less waste. 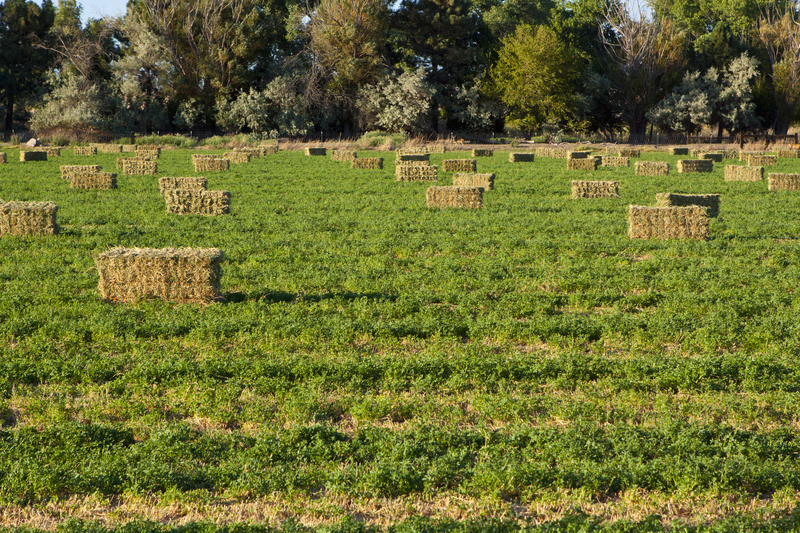 · Chopped- There are quite a few manufacturers that chop the Alfalfa into small pieces and sell it in a 50 pound bag. It’s usually harvested at the immature, pre-bloom stage of growth so it has good nutritional value. Some chopped forages are mixed with molasses and glycerin which helps reduce dust. At some time Analysis was used to determine the Amino acid content of your protein, as well as to determine the quality of the Alfalfa, so let’s take a look at this “A” word a bit closer. 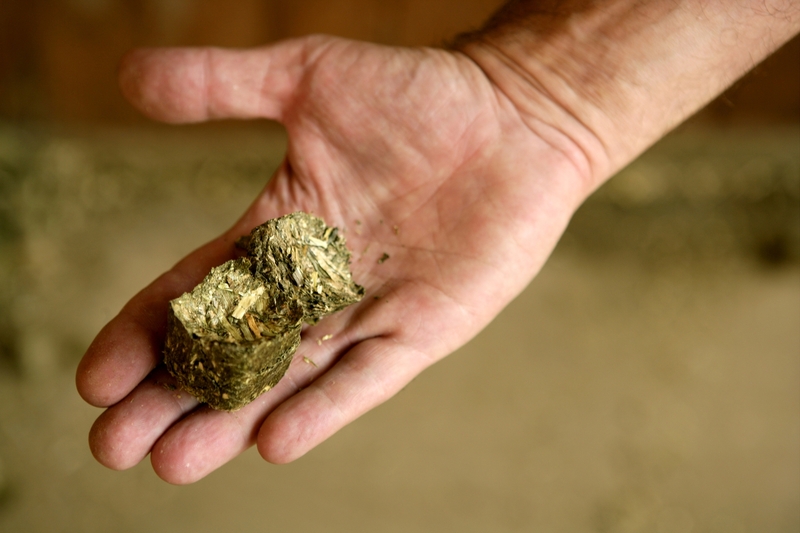 Analyzing your feedstuff is an important part of knowing what is in your horse’s ration. The foundation of the ration should be based on the science of Analysis. The mission of feed or hay Analysis is to provide you with facts about your feedstuff to scientifically balance your ration. Once the foundation ration is established, then experience can come into play to provide your horse with a well formulated, practical diet. Analysis results and rations can be evaluated on either an “as sampled” or “dry matter basis”. When all feeds offered are of a similar dry matter “as sampled” results may be used. For example, hay and grain generally average about ~90% dry matter. If they are the only feeds in the diet the ration can be balanced on an “as sampled” basis. Pasture, on the other hand, contains a significant amount of water and is much lower in dry matter. It can vary in dry matter (15 – 65%) depending upon the stage of maturity, season and geographic location. As such, rations containing feeds that are low in dry matter (i.e., high in moisture) are typically balanced on a “dry matter” basis. With hay there are two types of Analyses that can be performed; visual and chemical. If you have already purchased hay, then you have probably performed a visual Analysis. Chemical Analysis is when the hay is sampled and the nutrient content of the hay is determined by a laboratory. On your feed bag tag you will see a section with the guaranteed Analysis which provides information on concentrations of specific nutrients. 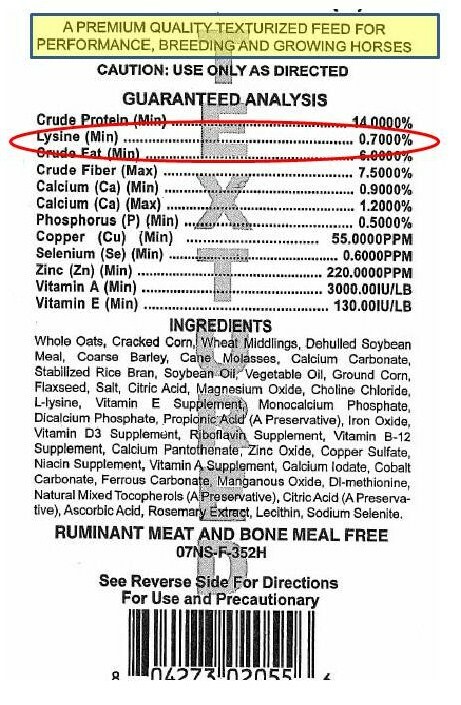 By law, feed companies are only required to guarantee 7 ingredients contained in the feed. 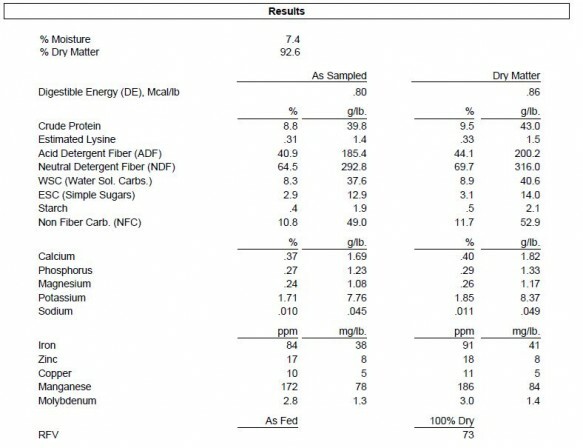 Feed manufacturers are required to list percentages of crude protein, crude fiber and crude fat (these are minimums), the minimum and maximum percentages of calcium, and percentages for the minimum value for phosphorus, the parts per million for copper, zinc, selenium and vitamin A in International Units per pound. 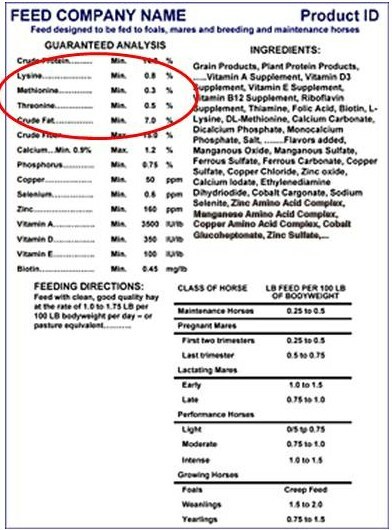 In addition to the required Analysis, companies sometimes will list other ingredients but unless it is part of the guaranteed Analysis you cannot be certain the feed has the correct amount your horse requires. This is why higher end feeds have more guarantees and also one reason why they cost more. Cheaper feeds might list an ingredient, like biotin let’s say, but they could just put a pinch of it in and say it’s in there. I would rather pay more for quality and assurance that takes the guess work out of my horse’s ration. The interactions of one ingredient with one another should be considered for a thorough job of ration balancing . Most professionals and feed companies use computer programs to Analyze and evaluate all factors. If you are uncertain what to make of your hay or feed tag Analysis consult with a nutrition professional like your feed dealer, extension agent, consultant or veterinarian. They have the knowledge of daily equine nutrient requirements and can help you to develop a fundamentally sound, fact based diet for your horses. Basically ADF is a measure of the fiber concentration of the hay, shown as a percent. 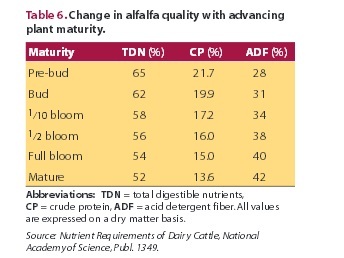 As ADF increases, digestibility and nutrient availability decreases. It’s what makes hay “stemmy” and provides low nutritional value. So ADF is negatively correlated with overall digestibility. ADF is a useful gauge of the quality of the hay and of the energy and digestibility of it. Low ADF values mean higher energy value and digestibility; therefore low ADF values are desirable. In fact, all of the energy estimates presently used in forage testing are calculated from ADF alone. The other factor to look for on your hay analysis is NDF or Neutral Detergent Fiber. This is a measure of the plant’s cell wall content in the hay. 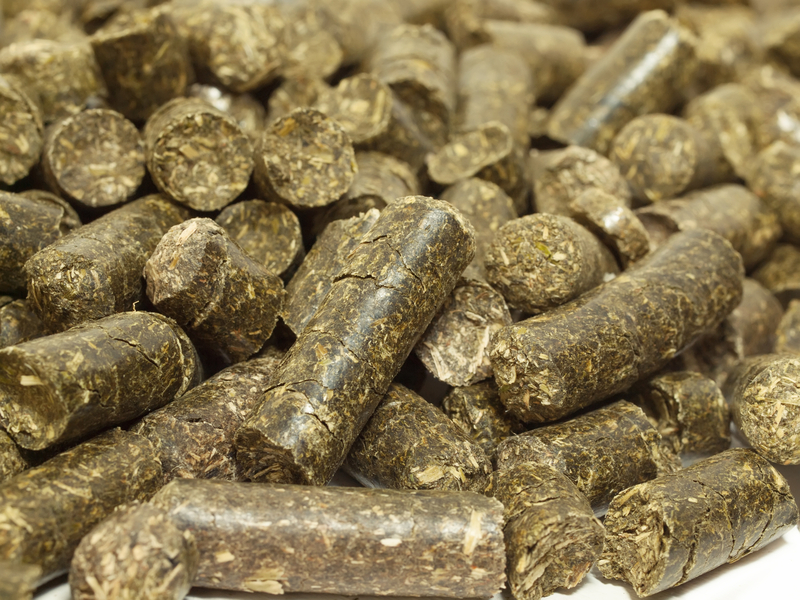 NDF measures hemicellulose, cellulose and lignin representing the fibrous bulk of the forage. These three components are classified as cell wall or structural carbohydrates. Much like a skeleton in an animal, they give the plant support as it grows. This is another value where a higher value is not better. 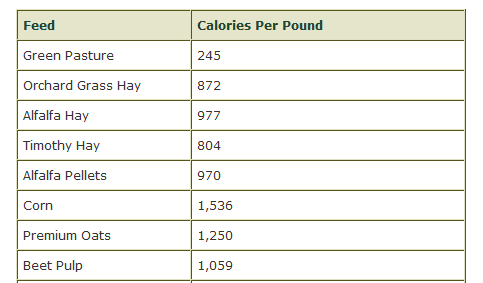 The higher the NDF value is the less the horse will be able to eat of the hay. 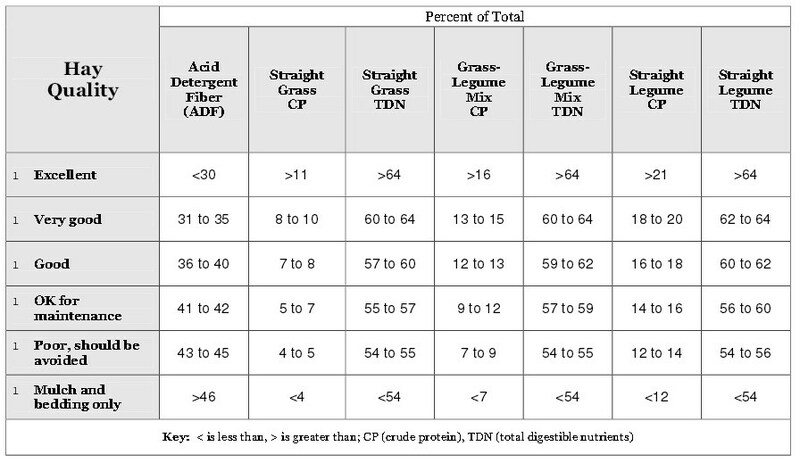 So basically NDF measures forage intake potential. If you see left over, wasted hay this could be an indicator of a high NDF. Good hay has low NDF as horses can and will eat every last bit. High quality forages are considered to have an ADF of 25 to 45% and NDF of 35 to 55% (as fed). 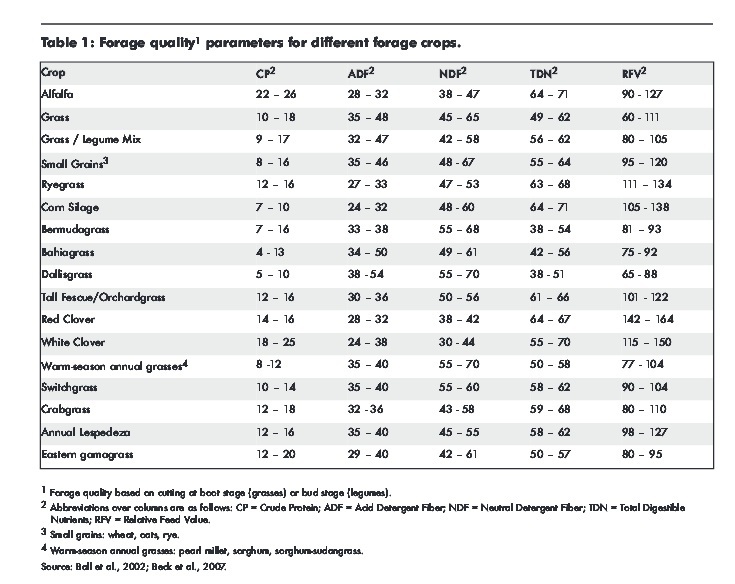 Lower quality forages are considered to have an ADF of 35 to 45% and NDF of 55 to 70% (as fed). 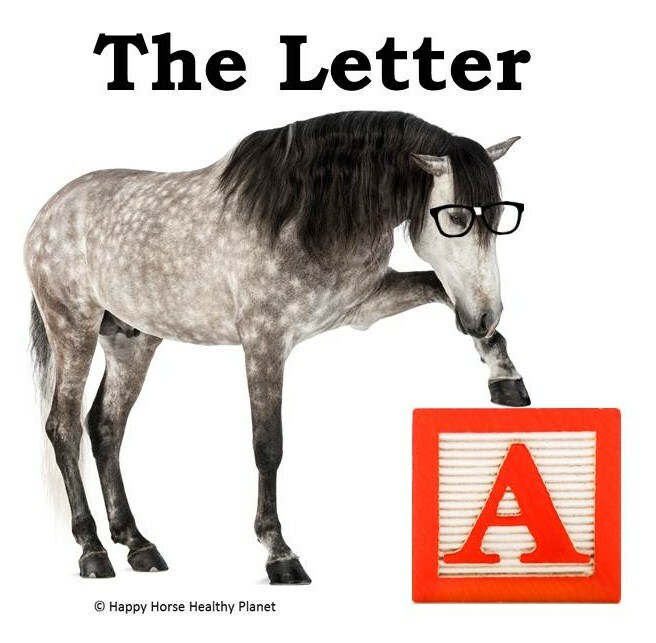 Well, that is probably enough for the letter A. I think it’s cool that the place you should begin your equine nutritional program, an Asessment, begins with the letter at the start of the alphabet. I hope you learned something about Amino Acids, Alfalfa, the importance of Analysis, and what the letters ADF means in your hay Analysis. Next week we tackle B. So “Be” here or be Square!